In this tutorial, we will demonstrate how to enable the Post Conversation Survey feature. This is a survey sent to the consumer by the agent at the end of the conversation . When we use the term "Post Conversation Survey" in this tutorial, we refer to the (new) Post Conversation Survey (PCS) and not to the (older) existing survey solution, where only a single CSAT question could be presented to the consumer when the conversation ends. Once the PCS Survey is configured and working, it will be presented to the consumer instead of the old one (CSAT) i.e. there is no situation in which both will work together. 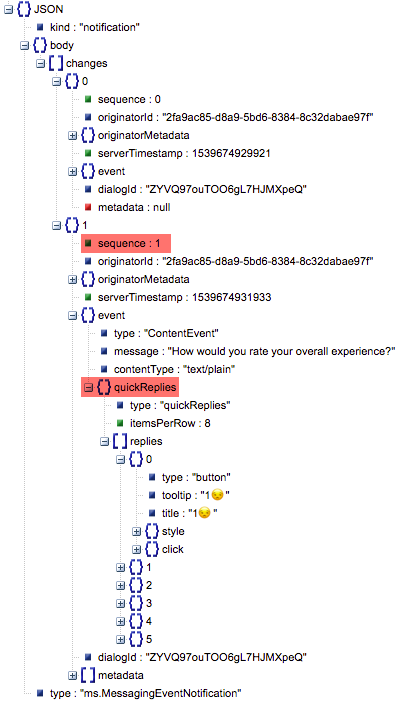 Up until now, a conversation contained only one dialog type (MAIN), holding the main messaging conversation and its data (messages sent, received, etc.). In order to support the new Post Conversation Survey, we developed a Multi-Dialog Conversation concept. This means that the conversation is a container for dialogs and can contain several such dialogs. There can also be multiple types of dialogs, where each dialog has a different channel type for example. Each dialog represents a different kind of interaction, like the conversation between a consumer and an agent itself or an interaction with a survey. The new Post Conversation Survey uses a new dialog type called the POST_SURVEY dialog. This dialog also has a channel type of MESSAGING. 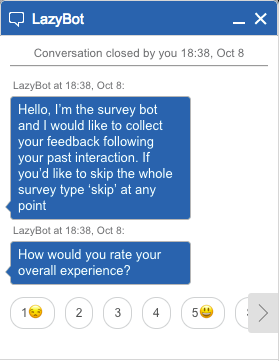 This dialog holds the messaging conversation between a consumer and a survey bot. The dialog itself provides the context of the conversation, whether it is a conversation between an agent and a consumer or a conversation between a bot and a consumer, such as in the case of the new Survey. The below tutorial assumes that you have performed the initial steps required in order to work with this API, which can be found here. Configure the Post Conversation Survey (PCS) and get familiar with it. Please refer to this guide for more information. You should get a shell line. Make sure that you have closed any previous conversation sessions by clicking Close conversation in the Agent Workspace. The sub property contains your consumerId. Note: If you encounter issues when using the shell base64 command, you can use online tools such as base64decode.org. 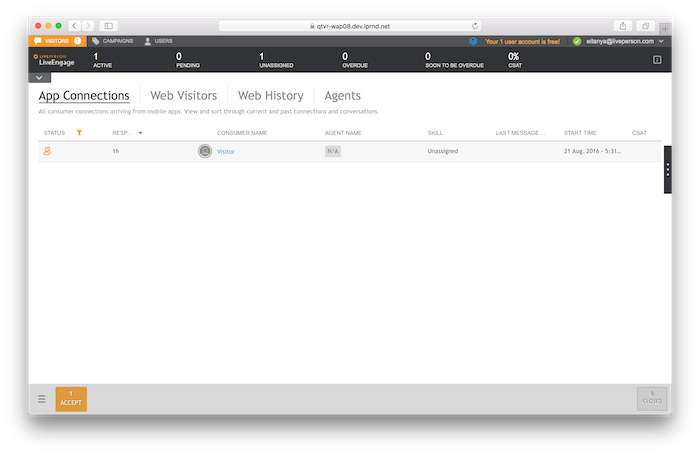 wscat -k 60 -H "Authorization:jwt $LP_JWT" -H "Client-Properties:$LP_PROPS" -c "wss://$LP_ASYNCMESSAGINGENT/ws_api/account/$LP_ACCOUNT/messaging/consumer?v=3"
Replace the __LP_ACCOUNT__ with your account ID. In order for the consumer to be notified when any changes occur in any of their relevant conversations (like a bot added to the conversation or a new agent for example) they must be subscribed to these conversations. In this step, the consumer will request a new conversation. Upon Survey creation (in the Bot Studio), a skill must be assigned to the survey. If no skills are assigned then the survey will not be triggered. In order to trigger the survey, start a conversation on the account and skill on which you’ve defined the survey and bring the conversation to an end, either from the consumer or the agent side. If a conversation is “unassigned” no survey will be triggered. A survey is triggered based on the last skill of the conversation. In the response you will receive the new conversationId. In this stage, switch to the Agent-Workspace and accept the ring of the incoming request. Click the blinking Accept button. Type a few messages in the Agent Workspace and send them to the consumer. In order to get existing or new messages from the agent side, the consumer should subscribe to the content of the conversation. Substitute the __YOUR_CONVERSATION_ID__ with the the conversationId you got in the response of the previous step, and paste it into the opened WebSocket. You will notice that you got all the messages that were published by the consumer, or by the agent. In order to find which messages were published by the consumer, refer to the originatorId field. Messages that were published by the consumer will have a value equal to the consumerId you found in Step 2 while messages from the agent will have a different originatorId. From this point on, you will receive notifications for all messaging events in this conversation. The below are examples for notifications that the consumer might receive after being subscribed to a conversation when it changes. Use the below to close the conversation when necessary by closing the main dialog rather than the entire Conversation container. In the above case, the dialogId (MAIN) is the same value of its conversationId but in general that doesn't have to be the case. For example, the Post-Survey dialogue would get a different dialogId. closedCause: Describe why the dialog was closed, mainly used by LiveEngage and Bots. Use Closed by consumer when closing the conversation from the consumer side. In case a dialog was not active for more than a week, the dialog will be closed by the system (autoclose). After closing the main dialogue, the Post-Survey dialog should automatically appear and visible in the Agent Workspace. You can see from the above notification that the Conversation now has a new stage field. stage is a newly added field in the ExConv notification that indicates the Conversation container status (open/closed) (thus indicating whether the entire Conversation, both main dialog and post-survey dialog, has been closed). The old use of the state field (which is now being handled by the stage field as indicated above) was deprecated and it will now indicate whether the Main Dialog is open or closed. After the dialog change (main dialog closed, post dialog open), the consumer should no longer receive messaging events on the conversation. Therefore, you'll need to subscribe the consumer once again to the new, open post-survey dialog. Use the last notification from Step 9 to extract the dialogId of the dialog with dialogType set to POST_SURVEY. As you can see from the above notification, the Post Survey is essentially a rich message including text, structured content templates (in this case a quick replies array which consists of eight clickable buttons that trigger actions) in one message. These templates and the quick reply buttons are all part of our Rich Messaging features. In order to familiarize yourself with Rich Messaging please review its documentation. You can see in the above example that apart from the text, there are several clickable buttons in a quick replies array included. Each one of them is a button. To make work with Structured Content easier, LivePerson has also built a renderer that displays this content within our unified window. In order to simulate this display you can use our Json-Pollock tool that utilizes this renderer. This enables you to test your structured content and rich messages in a sandbox environment before using them. The renderer code is also an open source project and can be forked and used in your code if needed. You can find the GitHub repository for this project here. For more information about Json-Pollock please refer to its documentation. You can copy and paste the button JSON object into the simulator to see how it is rendered using the json-pollock tool. As you can see from the above you have full control on the style of the button by editing the relevant keys, e.g bold, size, color etc. For more information about the style rules defined for basic elements, refer to this document. The design of your post survey, including its quick replies and button styles, is fully adjustable via the Bot Studio. Please refer to this document for more information. After the Post Conversation Survey appears on your custom window, the consumer can choose as per the above example one of the quick reply items which are actionable buttons. The sequenceList field matters. Review the notification that includes the Survey, received on step 11 and check the sequence number field for the object which includes the 'quickReplies' key. Then, use the same value when making this call under the sequenceList key (in this example, it is set to "1"). 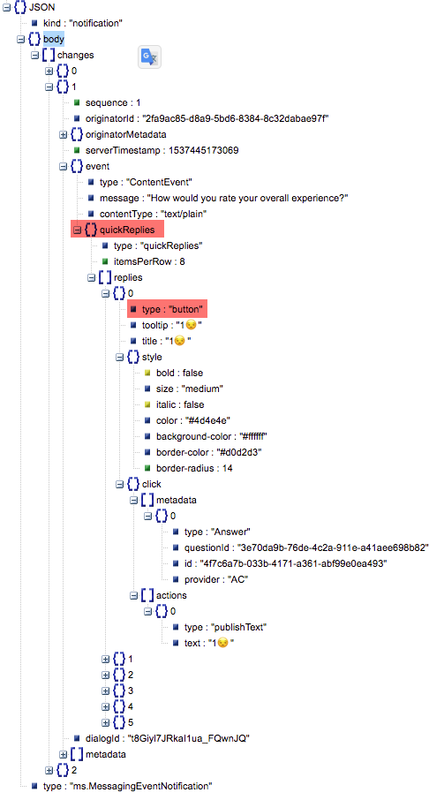 The metadata value is identical to the one received in the Post Conversation Survey for the specific button. Because we have configured in the Bot Studio one survey question only in this example, the conversation will close immediately after it. When it closes, we'll receive the following and lasts messaging notification regarding survey completion and the closure of the conversation. In case you have configured multiple sequential questions you'll need to repeat step 11 and step 12 per each survey question before you'll get this last notification. 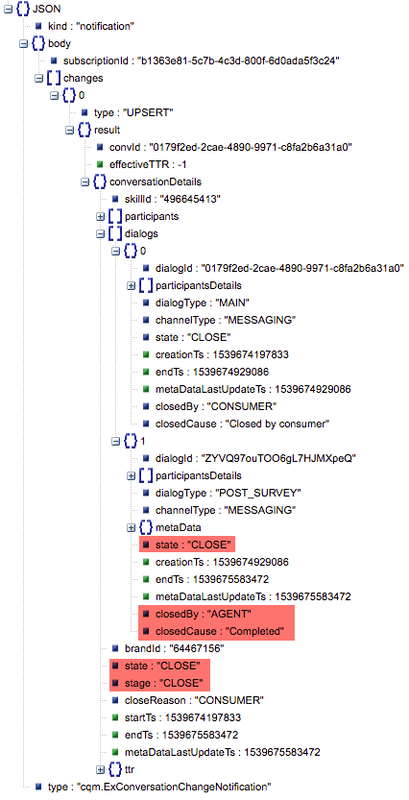 Unlike the example in Step 10, which only closes the MAIN DIALOG, in order to completely close the Conversation and skip the survey, you can call the UpdateConversationField API with the field stage instead of state and the conversationState set to CLOSE. This will close the conversation and all dialogs beneath and will not allow another dialog to open. This can be used for example if you configured the Post Survey but wish to simply close the conversation without sending the Post Conversation Survey to the consumer.